1. Heat the oil in a large saucepan and cook the onion, ginger and garlic for 5 minutes, until softened. Using a vegetable peeler, pare 2 strips of lemon zest (scraping off any pith) and add to the pan along with the chick peas and fennel seeds. Cook for 5 minutes. 2. Stir in the curry paste, tomatoes and dates and cook for 5 minutes, until the tomatoes are pulpy. Add about 100ml water and continue to simmer for 5-10 minutes, until thickened. Squeeze in a little lemon juice and season to taste. 3. Warm the naan breads. 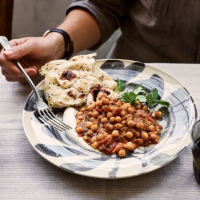 Spoon the masala onto plates and serve with the naan, a spoonful of yogurt and a scattering of coriander leaves. This recipe was first published in Tue Nov 01 11:11:00 GMT 2016.